A wonderful feature of recent times has been the gradual emergence and increasing visibility of gender diverse Christians. Although there are examples of gender diverse people in the Bible and Christian Tradition, for too long such people have remained hidden in religious life. Today it is becoming easier to be visible, although most gender diverse people will not wish to be visible, or given special attention, simply for their gender. Being able to be more fully oneself, without shame or other negative emotion, is such a blessing however, both to the person involved and church and wider society. 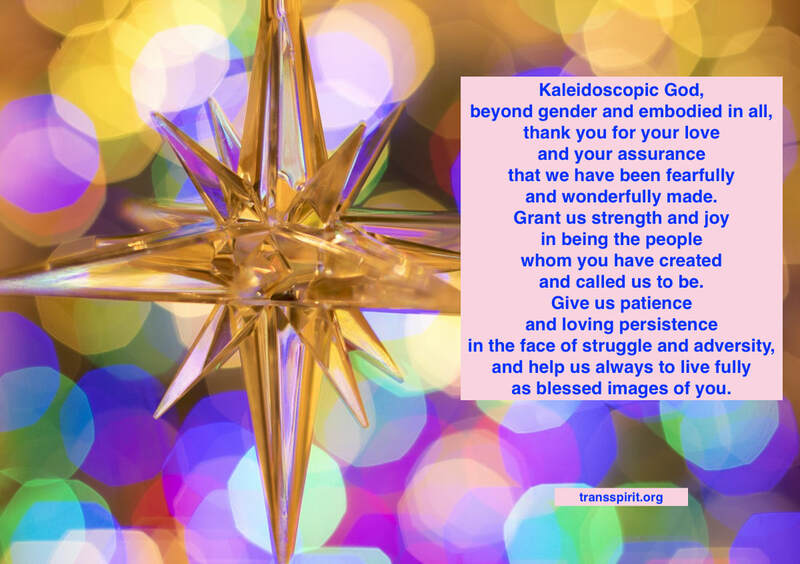 Instead of merely being talked about in a variety of usually unhelpful ways, visibility enables gender diverse people to share their own experiences, playing their part as equal members of the Body of Christ, enlarging our shared Faith and deepening love for all. Fully affirming gender diverse people helps to make this possible. The Transgender Day of Visibility is a day to which I’ve always looked forward. I’d like to be visible so that people know that trans people are explicitly welcome here. Visibility means many things to me but not least displaying more of the rich diversity of humanity, dispelling something of the darkness of shame and repression, and contributing to new life and flourishing. As a Christian and a priest, it also means unveiling another liberating face of God and love. When I transitioned, the cost to me personally was huge. It’s cost me family relationships, long term friends, financially and it even put a halt to my career. It’s not a decision that we simply make because one day we wake up and say ‘Hey, I’m going to transition to another gender.’ For me it came down to the fact that I either transition to my correct gender, or simply not be. I’m so happy now. A deeply committed Christian, Emily has recently found her home in the Anglican Church, being confirmed, by Bishop John Roundhill, among friends at the Anglican Church in Milton, Brisbane. Sorèl was brought up as an Anglican in the Diocese of Adelaide. Her early formative experiences, and remain so now, were as an altar server at early morning mass at Pulteney Grammar School, before the school day began. After leaving school she was confirmed in Perth whilst serving in the Royal Australian Navy. During her time in the RAN, Sorèl began to discern a calling to the Benedictine monastic life. To this day her spirituality is still shaped by a love of mysticism, wilderness, and silence. For most of her life, Sorèl was, herself, hidden away in a silent wilderness known only to her. In her place, for ten of those years, was a man revealed to all as “Father Simon”, an Anglican priest replete with all the trimmings of a full clerical “collar”, the ubiquitous black soutane, the many pointed biretta, and finished with delicate lace cottas. In the end, the calling of the Dear Jesus to live and become an authentically true human person took precedence above all else. It was He, who himself was stripped humiliatingly and starkly bare naked on the Cross, laid bare his soul as our Blessed Saviour. So it was that Simon chose to be stripped of his adornments too, and revealed not the man within but the woman, and, almost sacramentally, to become an outward and visible sign of the our dear Lord’s inward and spiritual love. But what of being a Christian and being gender-diverse? The Catholic Church says that transgender Christians are “intrinsically disordered people.” While there is an evolving theology of gender-diversity in the Anglican church, the practical application in reality, remains almost as problematic. While Sorèl still understands herself, still, as an Anglican Priest, and one who has become a Catholic, she nevertheless does not quite know where she belongs anymore, only to whom. The love of God revealed in individual Christians and local Christian communities has taken on a defining importance that is far more meaningful than any particular denominational label….. and that is a long way from a black gaberdine soutane over-topped with a lace cotta. In answer to the question of being a transgender Christian all Sorèl can now say is that she belongs to God, and God belongs to her, like never before.